The Clinton River Mountain Bike Association’s (CRAMBA) National Mountain Bike Patrol continues to grow and provide a great service for all trail users in Southeast Michigan. CRAMBA Bike Patrol has significantly grown since its inaugural year in 2013. 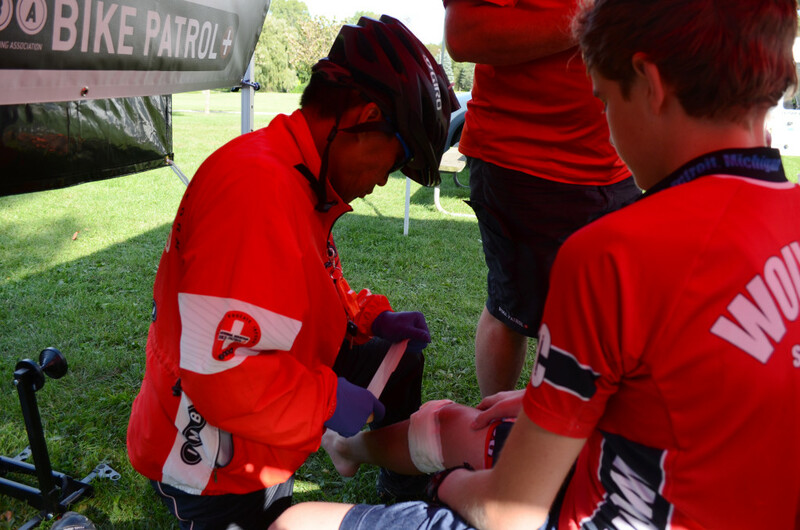 Over the last 3 years our numbers of patrollers increased, our working relationship with land managers and trail users are improving and many people are recognizing what the Bike Patrol provides. In 2015 we started off strong by extending our patrol season to all year. With the increase of fat bikes, more and more patrollers are out on the trails throughout winter as well. CRAMBA Bike Patrol also improved by hosting two new patroller orientations and training sessions. The training sessions included First Aid/CPR, trail etiquette, trailside maintenance, conflict resolution and Land Manager relations. 37 active CRAMBA patrollers put in a remarkable 2919.86 hours of volunteer time in 2015 from 1087 logged patrols! They also logged more than 14,000 miles of trails patrolled. Log reports showed trail assistance provided anything from providing maps and directions all the way to stabilizing efforts, 911 activation and patient transfer to local EMS. All of this is provided free of charge, by volunteers. Also, in September, the National Director of the IMBA-National Mountain Bike Patrol in Boulder, Colorado flew out to meet with CRAMBA Patrollers and film a promotional video for the Bike Patrol. Several CRAMBA patrollers participated in the video that helps explain what the Bike Patrol is and what we provide. The video can be seen on YouTube at https://youtu.be/negBTR1m4wc . This was a great honor for our group to be featured and highlighted on the national level. The group is planning for training in the spring of 2016 to add to our wonderful group of volunteers. For information about requirements and basic program overview, please go to CRAMBA-IMBA’s Mountain Bike Patrol page. If you are interested in joining or have any questions, please send an email to bikepatrol@cramba.org. This is a great opportunity for you if like to ride and like to help others.